UMass Amherst coach Greg Carvel is a native of Canton, New York, home of his alma mater St. Lawrence University. In 2012, after 14 years as an NHL assistant, he returned to St. Lawrence for his first head coaching job. By his third season, he had SLU in the ECAC Championships in Lake Placid. By all accounts, he was living the North Country dream. But in 2016, after two straight winning campaigns, he confounded insiders and experts alike by leaving home to take over the program at UMass. The Minutemen hadn’t had a winning season since Jonathan Quick left a decade ago and had become second-class citizens of Hockey East. They were known as the team that played in front of 7,000 empty seats at the Mullins Center in Amherst. 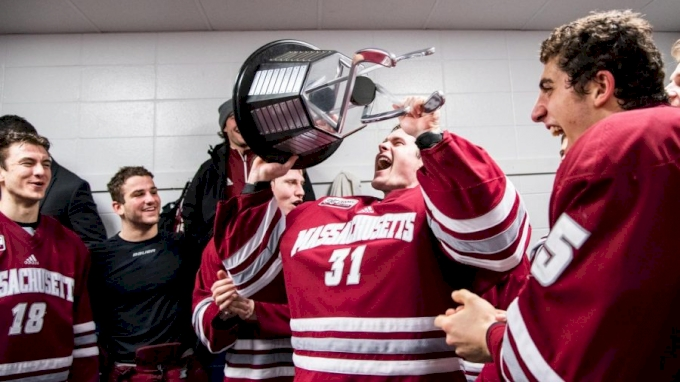 Two seasons later UMass is the talk of the hockey world: No. 1 in Hockey East, No. 2 in the country and the home of Cale Makar, the most electrifying college player of this century. FloHockey’s Tim Rappleye caught up with Greg Carvel to try and make sense of the uncanny turnaround of UMass hockey. FloHockey: You were living a dream, coaching your alma mater into the Lake Placid Championships, and suddenly you bolt to UMass, a place considered a hockey graveyard. What was your reasoning? Greg Carvel: I was really happy at St. Lawrence, I wasn’t looking to leave. We were building something pretty good there, one of the top teams in the league my last two years. But UMass asked to interview me, and I agreed just to see what the program was about. My wife is from Amherst, so I know the area really well, I love the area. I met with Ryan [Bamford, UMass athletic director] for three hours, he offered me the job. I just decided that the potential at UMass, as far as facilities and resources to build a national contender, was better. There was obviously no guarantee, there was a leap of faith. It was not an easy decision to leave St. Lawrence. It was very emotional. I grew up in that area, but something in me told me I needed the challenge. Carvel: Absolutely. You know, we won five games our first year here. It was a lot of pain. But at the same time, we knew things would turn around, we had good players coming. But I don’t think anyone could have imagined that it would happen this quickly. Our goal was to bring respectability back to UMass hockey, be an NCAA team. We’re pretty well on the way to securing that—when you walk into the Mullins Center and there’s 8,500 people, you take a lot of pride in that. In year three we’re way ahead of the curve, but at the same time, we won’t be happy unless we make some noise at the end of the year in the playoffs. Flo: You’re known as a serious coach, a serious guy. But there’s a new marketing component at UMass, a new Twitter hashtag, a fun video the staff put together. There seems to be a little Ringling Brothers going on. Were you persuaded to do this, or is this a side to your personality we haven’t seen? Carvel: No, you’re right, I’m more of a serious coach. I worked with Mike Babcock for a few years, and one thing he preaches is that you always have to be growing, have to be adapting. I realize that I had to be involved in Twitter, I needed to be active in social media. I wrote it up on the board. We have a big Power U, and I wrote “NEW” in front of it. That NEW has never been erased, in two and a half years now. It means no disrespect to the previous players and teams here, [but] there needed to be a new attitude around the program. We want to be the program that everyone wants to point at and says, That’s the program we want to be like. Flo: Every marketing campaign needs a star, and it appears you have that in Cale Makar. He impressed everyone at BU last week. What’s he done for this program in terms of visibility? Carvel: Our program has moved forward quickly, but he’s helped us step on the accelerator for sure. In a game that had three first-round draft picks for BU, he was the guy who jumped off the page. He is an explosive skater, he plays with an edge, he’s so quick and skilled, he’s given our program a ton of credibility. He wants to bring UMass hockey to legitimacy. Having him come here gave us a lot of the respect that we spoke about earlier. He is, to me, the Hobey Baker winner. He’s the most dominant player. Flo: UMass has only made it to the Hockey East semis at Boston Garden once in its history. Are you allowing yourself to declare that a goal, making it to the Hub of Hockey? Carvel: At the end of last year, when we lost to Northeastern in the quarterfinals, as a group we almost instantly said our goal next year is to get past this round and be in Boston. Every game is a dogfight, if you don’t have that focus on the game in front of you, those goals down the road will disappear. As a group, we’ve done a great job this year of just maintaining our focus, playing game-to-game and not getting too far ahead of ourselves. It’s really tough to win. Like I said, we want to be an NCAA team, we want to find a way to get to Boston for the semifinal at the end of the year. We’ve done a good job of just going through the process. Flo: There’s a risk/reward element to your career. You could have stayed at your alma mater forever, but instead you took a big chance in going to UMass. Did you sense the risk? Carvel: Absolutely. I’ve done this throughout my career. I was married, my wife was in grad school, I took a risk and went out to California and worked with the Mighty Ducks. I didn’t know what I was getting into, I was there with Mike Babcock, was able to make the Stanley Cup Finals with his coaching staff. Then I was asked to go to Ottawa with Bryan Murray and that was a bit of a risk, too. Mike didn’t want me to leave, but I thought it was a challenge I needed to take. Going back to St. Lawrence was a complete unknown. It was almost a dare, because some people said, “You can’t win there.” For whatever reason, I wanted to take on the challenge. I give a lot of credit to my athletic director Ryan Bamford, my assistant coaches and all the people who helped make this happen. I’m just one part of it. Ultimately, it’s the players who make the difference, and we’ve just been able to bring in real high-quality kids, who are great players, too.